Many many moons ago, I saw a KickStarter for something that interested me – a motion controller, so I signed up, paid, and promptly forgot about it. Last week, I got a notice about shipping, and then a few days later Fedex China asked for a sample of my blood, a copy of my grandmother, and 16 forms filled in triplicate so that they could release the shipment. As I’m not really much for reading instructions, I plugged mine in, and saw that it pops up as a standard USB device (well duh, its usb!). It does need drivers to make it work, so off to http://leapmotion.com/setup I went, to grab drivers. They’ve definitely spent some quality time making sure that things look good. Well, maybe not; it crashed almost immediately! It did popup a message via notifications before it crashed though. Reopened their app, and it wants me to sign up. Their app is quite buggy – ran the updater, and it also froze, leaving the updater in the middle of the screen. (Software Version: 1.0.2+7287). I’m *really* not a big fan of that, so off to find some app’s that I don’t have to download from an app store. BetterTouchTool http://blog.boastr.net/ has preliminary support for touch ui, so I thought I’d download that first. 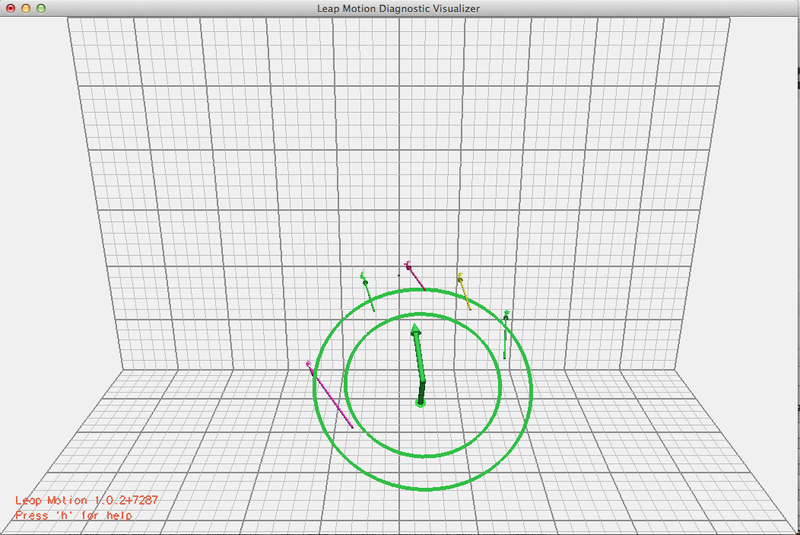 Installed BTT, and added some gestures using the Leap Motion settings. 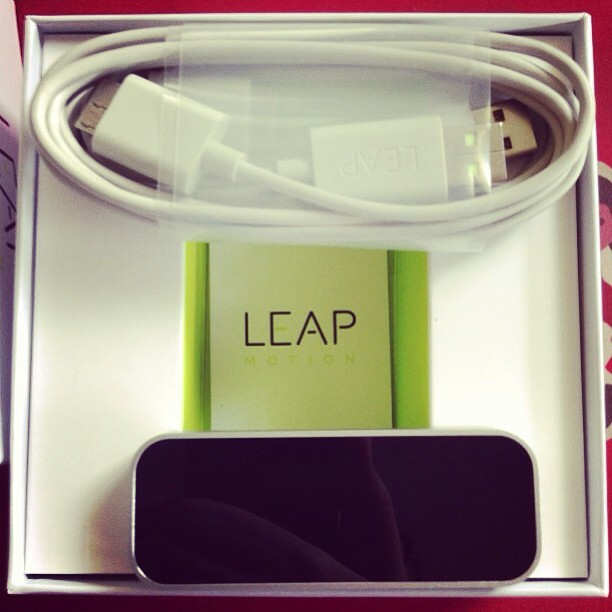 Not much seemed to be happening – my initial settings didn’t seem to make anything happen when i waved my hands over the device, so went back to the Leap settings. Leap has a visualizer tool which doesn’t work on my Mac – immediately crashes. Probably as I have 3 screens, and they didn’t test very well. So far, not really a good experience. Consistent repeatable crashing in the Leap software. 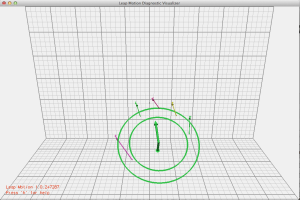 They do have another tool in the settings – Diagnostic Visualizer, which actually does work. Here it is showing detection of 5 fingers. Now that I finally had it working, how is it? Well, the placement of the sensor is important. It seems like it doesn’t actually read above the sensor, and the i/r led’s are placed at a 45 degree angle facing you, as when I placed the sensor in front of my keyboard and motion above the keyboard I get better results. Its extremely flaky though – I can’t reliably get it to detect finger movements. You have to try and retry and retry the same action before it works. Its not quite the swipe your fingers over it and it works that I was hoping for. 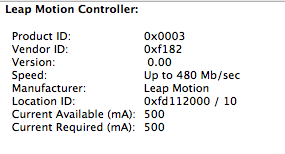 There is also latency in the motion detection. Initial detection of fingers in app is about 300-500ms before it see’s them. So a swipe over the sensor doesn’t work unless you sit fingers above it then swipe or perform your action. This really doesn’t help it. As placement of the sensor is extremely important, I tried a number of different arrangements, but all were pretty similar in reliability. I honestly get about 20-30% of gestures recognized at best. Even with the Diagnostic visualizer running so I could see what the device thought it was seeing, it was hard to reliable perform actions, even when I sat in its sweet spot. 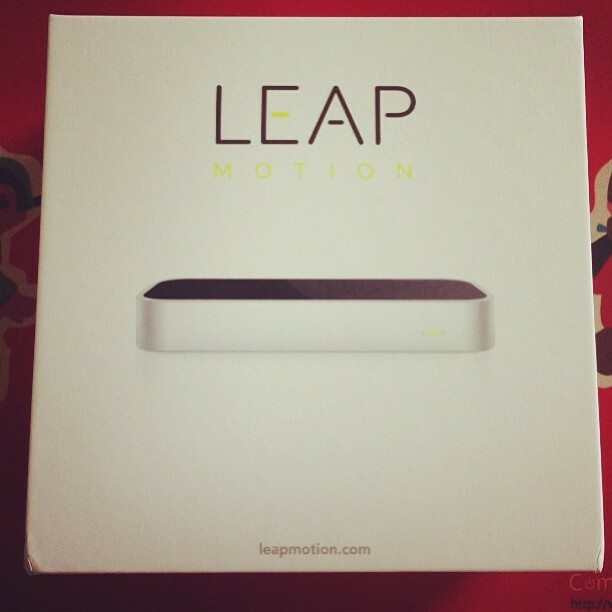 My Kinect is a *lot* better at this than the Leap is. As it stands, this is little more than a tech demo, and a bad one at that. If I could persuade one of my staff to video my attempts to use it so you could see, you’d understand! So, this has a long way to go before its something usable, but I do have hope. I’m sure that the software will improve, but for now this is definitely a concept piece rather than something usable. I’m not unhappy that I paid money for it though. The interest in this technology has put a lot of investment capital at the device, and it will improve. Addendum – my device gets rather hot in use. Not warm. Hot. Noticeably so. Even in the bare 10-15 minutes I’ve had it running. Not sure how long it will last in Shanghai summers..
Addendum #2 – seems to have cooled down a bit from the rather hot to the touch that it was running at, although now its stopped working completely. Unplugged it, and replugged it in, working again, but it looks like both the drivers and the ui side need work. This isn’t production ready by any way shape or means. We often have clients that complain about wifi in different area’s of their apartment being weak. 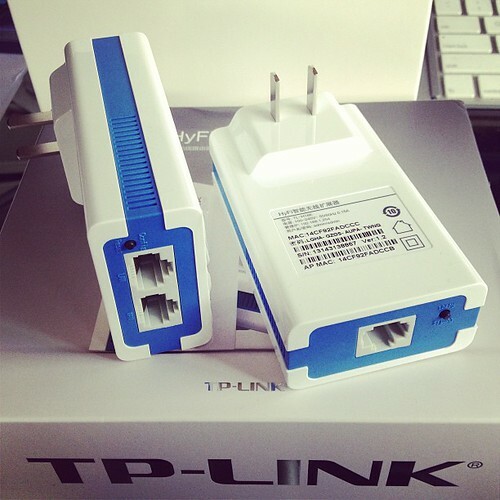 While there are a number of solutions to that, such as running additional cabling, adding additional routers via WDS, using 电力猫 (ethernet over power) adaptors etc, we decided to try out a newish all in one solution from TP Link. 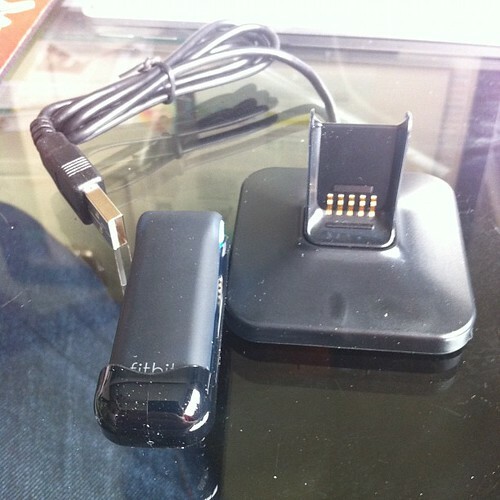 This ties together 2 paired mini wifi routers via power over ethernet (HomeAV). See the Chinese diagram below for a clear example. 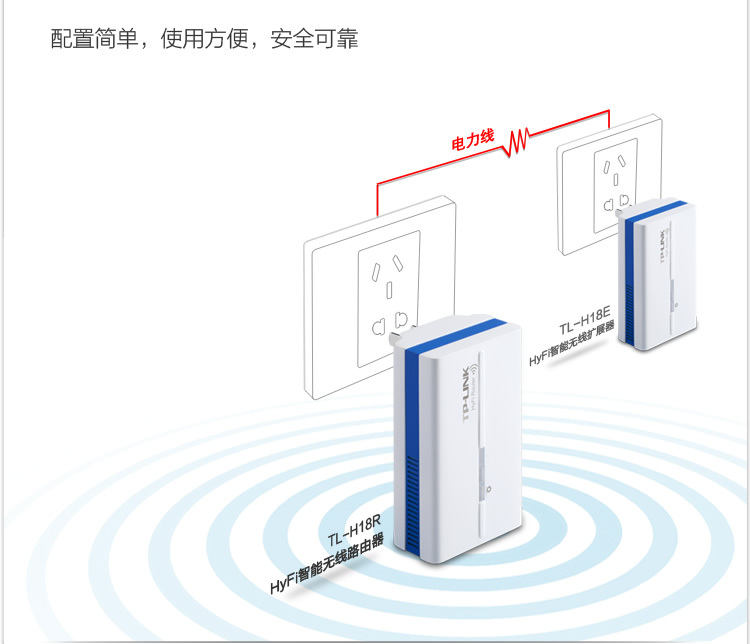 Well, you can plug one router in where your internet connection is, then plug the other router where your signal isn’t 😉 With a bit of luck, it will connect successfully over your power lines automagically, and there is no configuration needed other than adding in your internet settings at the router side. 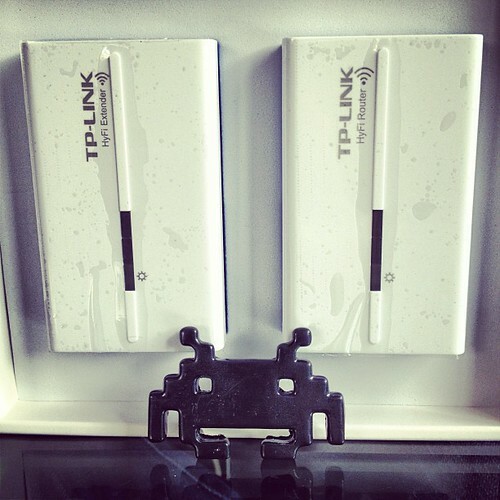 The units provide both Ethernet and Wifi at both ends, so they’re a good solution for both wired and wireless access. The units we bought only have Chinese firmware at the moment, but its pretty much set, and forget for most users. They also come reasonably well documented – each unit has a sticker with its ip address and user/pass. Yay! As you can see below, one unit has 2 ethernet connectors, and the other has 1 ethernet connector. The unit with 2 connectors sits at your modem side (it can also extend an existing network if you have another wifi router already). 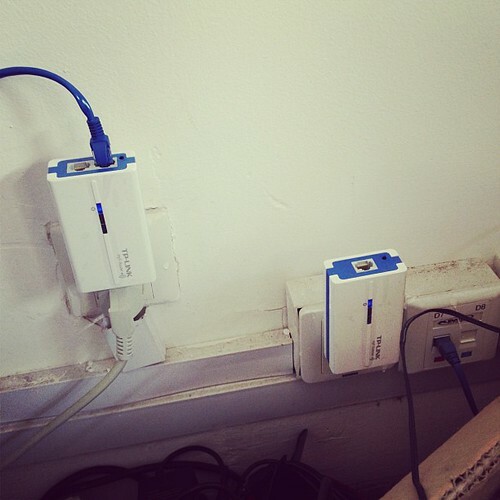 The WAN port plugs into your modem or network (as appropriate for your needs). The LAN port provides a network port for use. The other unit plugs in elsewhere (eg in a suitable location where you need wifi or wired connection). device, so whats written on the back of the unit no longer applies. Stumped me for a few seconds till I realised and went doh! Here is our suitable test bed. The units are a bit flimsy, but seem to work fine in our limited testing. 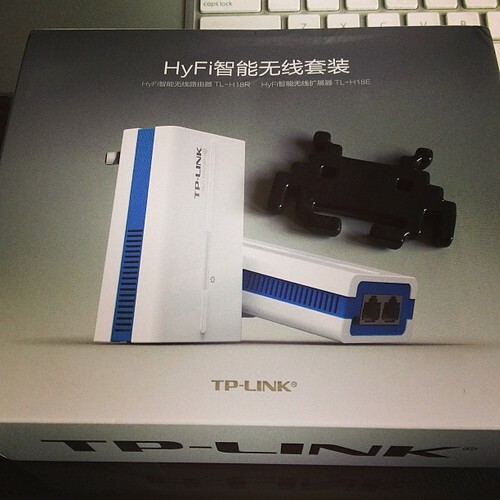 Extra units – RMB133 (you can have up to 7 units tied together to extend your network). I’d give these a rating of 7/10 – they’re cheap, and they work. Fitbit first look – verdict: just say no. I’ll prefix this with my initial recommendation – don’t buy till they make it work. First though, a little introduction. I’m unhealthy. I like gadgets. I’m up for trying something that will improve my health. With that said, Arstechnica had a little opinion piece on a motion tracking device called the Fitbit – its a motion sensor that tracks how much excercise you do during the day. My interest was piqued, and I bought one based on the writeup there. Unfortunately my user experience was completely different to the one in the review. There are chinese equivalents to this on the market, but as people have found, the chinese generally spend more emphasis on the manufacturing side over the software engineering side. Mostly as factories here mostly do OEM work, rather than the longer term more lucrative, but riskier development. 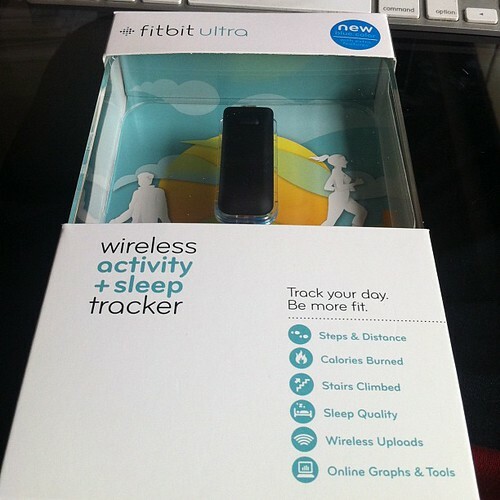 As stated, software is generally the difference between these things – Chinese can make good hardware, but software usually takes a backseat, hence my getting a US made (well Singapore made) device like the FitBit. This is 700rmb locally, which matches up with the 99$ price + some profit for the seller. Build quality is not as good as you’d expect for the price. It feels cheap, and has that its going to break within a month or two feel. The clip that it comes with has sharp edges, and pokes into your sides if you wear it. A little more care on the moulding process, and use of a softer plastics mix would yield a much more consumer friendly device that the current one. Packaging is quite a bit too over engineered imho. The transparent box the device comes with is nice, but essentially useless once out of the box. I’d rather they spent the money on the clip and device instead of on the packaging used. That’s the physical side, onto the hardware. 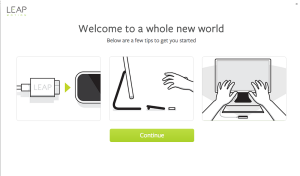 Out of box experience isn’t great (I’m a Mac user). You get told to download the App, which I did, and install. Unfortunately the App just doesn’t work. You can’t signup. You can’t bypass the App either to use the device. This isn’t a network issue, as its the same over a VPN or without (which often is the issue within China). Looking at the console logs shows that their site is returning a site is offline message to the app, but the app doesn’t display this, nor does their site indicate in any manner that its down. Apr 11 12:34:08 Lozs-iMac com.fitbit.fitbitd: Apr 11 12:34:08 Lozs-iMac.local MacUserInterface : Ignoring unexpected HTTP response . 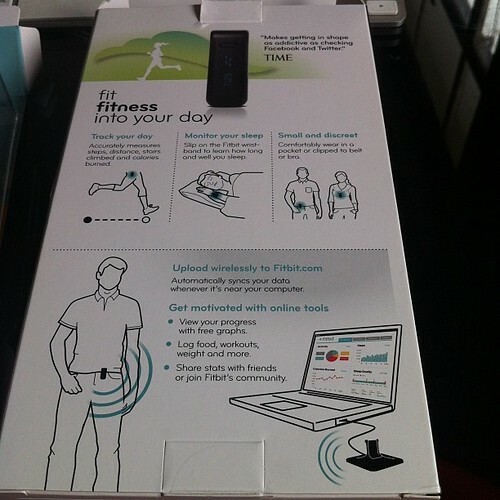 Apr 11 12:34:08 Lozs-iMac fitbitd: : Request for http://client.fitbit.com:80/device/tracker/uploadData completed. Apr 11 12:34:08 Lozs-iMac MacUserInterface: WriteHTML called with NULL target. Apr 11 12:34:08 Lozs-iMac com.fitbit.fitbitd: Apr 11 12:34:08 Lozs-iMac.local MacUserInterface : WriteHTML called with NULL target. Ok, so the app doesn’t work that well. How about the website and integration? Well, the very first thing I tried their also didn’t work. Their Facebook signup sync doesn’t work either. "Unable to finish authorization with Facebook. Received Facebook error response of type OAuthException: Error validating application. Invalid application ID." I’d really like to like this, but so far I’m really underwhelmed. If it actually worked I’d probably be introducing this to all my friends and expounding on the virtues of exercise and gadgets and such, but not in this case. I haven’t been able to use mine yet, and I’m already fairly unimpressed with what I’ve seen so far. It has glimmers of brilliance – the unit has a neat display that shows steps counted, and possibly some other custom messages that I would be able to set if their software actually worked, but I can’t. Will see what their support is like, and update this further when I get replies.